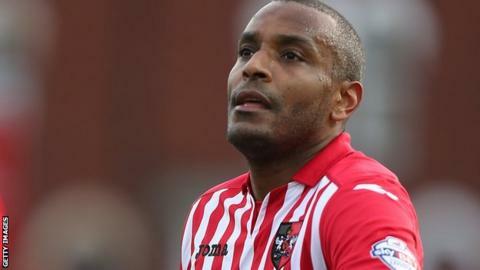 Exeter City manager Paul Tisdale says he will decide at the end of August whether to offer veteran striker Clinton Morrison a new contract. The former Republic of Ireland forward, 36, spent most of last season at St James Park after initially joining on non-contract terms. Morrison has signed until the end of the month and came on as a substitute in Saturday's win over Yeovil. "We'll re-assess this at the end of the month," Tisdale told BBC Sport. "For the time being he's part of the group, he's training and I'll be judging him like any other member of the squad. "By the end of the month, it'll be a bit more clear as to how we're going to proceed. In April, Morrison told BBC Sport that he would only consider extending his 18-year career as a professional if it was with the League Two club. "I've been clear all the way through - he wasn't a priority to me, but I didn't want to lose him either," Tisdale said. "It's not always the most simple thing to sell to a player, but he's been very good, we've communicated over the summer and I like having him here. "He's very good within the squad and I know the supporters like him, but I only have so much money to spend and I have to plan it wisely and shrewdly."